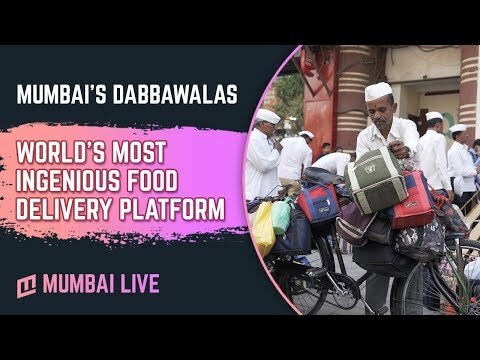 In an exclusive interaction with Ritesh Andre, the Spokesperson of Dabbawalas, we found out how this unique food delivery service has evolved over 128 years to become the most efficient business models around the globe. Some of us proudly call ourselves tough for residing in a city like Mumbai, which is known to have a pace which tires invariably everybody. But beneath our veil of resistance to circumstances and situations, we often find ourselves complaining about humidity, heat, rain, roads, potholes, train schedules, etc. The list of things about the city which bother us is endless. However, some don’t fail to remind us what being a true Mumbaikar really means. For instance, the Dabbawalas find it in their heart to serve their customers, come what may. Weather and transport is never a limitation for them. Be it Mumbai Rains, or a Mega Block, Dabbawalas will find a way to deliver your 'dabbas' (lunch boxes) on time. In an exclusive interaction with Ritesh Andre, the spokesperson of Dabbawalas and the grandson of the founder, we found out much about this unique service. Talking about the mentioned efficiency, Ritesh said, "Customers are our gods.” He further added that all the dabbawalas keep their service above themselves, prioritising the emotion behind serving food to someone. Established in 1890, Mumbai’s Dabbawalas are famous worldwide for their work. Attracting attention from the British Royalty and Richard Branson, the Dabbawalas have even got the six sigma standard for their efficiency. Giving a background to where it all started, Ritesh said, “Dabbawalas started in 1890, about 128 years ago. Mumbai was not a big city at that time. There were hardly 20-40 corporate buildings then. Mumbai wasn’t as developed for major trading businesses. However, at that time, the city had a huge number of Parsi people residing here. They majorly traded in Mumbai. Our founder used to work with them as an office boy. The Parsis generally loved home food. They didn’t enjoy food from outside much and there wasn’t any technology to prepare food in 5-10 minutes. Food took 1-2 hours to be cooked and the Parsis reached their offices before 8 in the morning. So, one day, someone’s food wasn’t prepared on time. So he told my grandfather that he hasn’t been able to get lunch from home and requested if he could get the lunch box from his house. He agreed and picked up the 'dabba' from his house and delivered at his office. His employer felt good about the fact that he came to the office carrying no luggage and that the lunch box reached directly to his office. He asked him to do this regularly for him and that he will pay him for it. And our founder agreed." Eventually his colleagues also asked our founder to deliver lunch boxes. He hired 2-3 more people because of more pickup points. This is how the system developed. The number of people involved in the process started increasing and the so did the dabbawalas. It started with 1 customer 1 dabbawala and now we have 5000 dabbawalas all over Mumbai and they deliver 2 lakh lunch boxes. Like any other venture, the dabbawalas have evolved over a period of time to tackle the growing number of customers in the city. To avoid confusion and to maintain efficiency, the dabbawalas make use of numbers, letters and symbols to ensure an efficient way of identifying the 'dabbas'. Owing to the six sigma standard, delivering over two lakh 'dabbas' each day, there is a probability of just 1 error in 6 million cases. Ritesh mentioned that from threads to cloth strips and finally to paint, the coding system of the dabbawalas have been developed to be more efficient, providing little room for mistakes. The Dabbawalas are given a prior training of 3 months before they start delivering 'dabbas'. It is quite marvellous to notice that, despite limited knowledge and education, a group of people could develop something so unique that universities like Harvard come up with case studies on them and study their strategy. We often find ourselves cribbing over an Amazon or a Flipkart delivery or simply over Zomato delivering our food late or making mistakes. It is quite a wonder to notice that Dabbawalas always have a satisfied customer. It is true that serving food is one of the noblest things to do in the world. However, this is not the only noble thing the Dabbawalas have done in the past. From Roti Bank to Kapda Bank, the Dabbawalas have been contributing towards humanity extensively. Providing extra food to the underprivileged and clothes to make their festivals brighter, this group of 5000 men have been spreading smiles across the city. Talking of another initiative called Share My Dabba, Ritesh said, “One day the dabbawalas were having food during their lunch time. There were some poor children who came and asked for some food. The dabbawalas told them that they can’t give them food but they can sit and lunch with them. So, when the dabbawalas told their President about it, he said that if such children need food, we should do something about them. They started getting one extra 'dabba' from their houses and shared the food with the children." With 200-400 dabbawalas operating on each station across 70 railway stations in Mumbai, the Dabbawalas have emerged to have an eco-friendly business model, without the need for a manual office. Making use of just trains, bicycles and carts, dabbawalas use no electricity, no paper and no fuel to complete 4 lakh deliveries of 2 lakh dabbas back and forth. Ritesh also mentioned how Dabbawalas are soon to delve into the online food delivery space, competing against the bigger giants like Swiggy and Zomato. It is quite remarkable to see these 5000 workaholic men challenging well developed businesses with a system which started with nothing more than one dabba and one dabbawala, only to become the lifeline of the city now.